← Did You Think the Volcker Rule Stopped Wall Street Banks from Owning Hedge Funds? Think Again. It’s time to ask this question: is Facebook wearing the friendly façade of a social media company while actually operating as a high tech citizen surveillance center? We’ll get to that in a moment, but first a look at what an actual citizen surveillance center looks like in New York City. In 2012 we broke the story that the intrepid CBS investigative program, 60 Minutes, had aired a fawning piece on the Lower Manhattan Security Coordination Center. That center is a high tech surveillance center built with over $150 million in taxpayers’ money that uses thousands of spy cameras owned by Wall Street banks together with thousands more owned by the New York City Police Department to spy on millions of law-abiding citizens in lower Manhattan. Data feeds from the cameras are routed to a central computer in the center where individuals can be zoomed in on and tracked without a warrant for probable cause. In a 2006 report on the lower Manhattan camera surveillance network, the New York Civil Liberties Union noted that “Today’s surveillance camera is not merely the equivalent of a pair of eyes. It has super human vision. It has the capability to zoom in and ‘read’ the pages of the book you have opened while waiting for a train in the subway.” The report further explained that “New York City has a long and troubled history of police surveillance of individuals and groups engaged in lawful political protest and dissent. Between 1904 and 1985 the NYPD compiled some one million intelligence files on more than 200,000 individuals and groups — suspected communists, Vietnam War protesters, health and housing advocates, education reform groups, and civil rights activists.” Indeed, the Lower Manhattan Security Coordination Center came in handy during the Occupy Wall Street protests. What this Orwellian public-private partnership is doing with surveillance in the bowels of lower Manhattan is not that different from what Facebook is doing on a dramatically larger scale from its sprawling campus in Menlo Park, California. This coming Wednesday, the Senate Intelligence Committee will convene a hearing dubbed as “Foreign Influence Operations’ Use of Social Media Platforms.” Sheryl Sandberg, Facebook’s Chief Operating Officer, and Twitter CEO Jack Dorsey are expected to appear to testify. 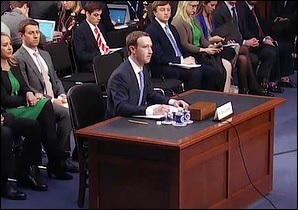 Google’s co-founder, Larry Page, and CEO Sundar Pichai, were invited to testify but have not yet confirmed if either will attend. But Russia and other foreign actors are not the only threats to weaponizing “social” media’s data vaults to undermine U.S. elections. As we reported last week at CounterPunch, Koch Industries, the fossil fuels conglomerate, now owns a sprawling voter data harvesting operation called i360 and is selling the platform to state Republican parties and individual Republican candidates running in this year’s election. i360 lists Facebook as one of its digital advertising partners. Let’s hope that the Senate Intelligence Committee has the intel on i360 and the guts to ask why a multi-national fossil fuels conglomerate has inserted itself into U.S. elections in this way.